This time of year is always a bag of mixed emotions and memories as seen from my Facebook memories. The feed is pictures and posts of accomplishments and challenges overcome. It’s more than that though as it’s a reminder of who I was and where we would end up. Through challenges you discover who you are and from struggle - actual struggle, not fictitious or superficial - that your character is defined. It’s been right around a year since I not only stepped down as President but also officially stepped away from derby. When I saw the posts come out about the league getting a new place I was simultaneously saddened and joyful. Obviously, I am excited for Penn Jersey that not only have they found a new space but one with so much potential. However, I was saddened because the old warehouse, one that so many of us poured our time and energy into, was my sanctuary and respite, and it will no longer exist. It will be there but mostly as memories. Hopefully the landlord leaves the mural up; it’s still amazing Clob. There was a love/hate relationship with the place during my time in charge. Four years ago, we would start renovating and commence “polishing the turd”. As we’ve stated many times before, LA’s former Doll Factory was the inspiration for us at Battle on the Bank. When we came back from our first Battle, it was time to go to work. The naysayers were plenty - not least of whom was Ratchet who was Prez before me. But as much as he and Maulin would harass me to start playing derby, I harassed him to ask the landlord one more time if we could paint the walls. The harassment and “No’s” mostly came before Battle. During Battle, all he and I could do was snap pictures and take down notes. After battle he asked again, finally a “yes” from the landlord allowed us to paint. Almost fours year to the day PJRD had announced their move, we began painting the walls, thanks in large part to Kapowski’s dad giving us pallets of used primer paint. Not sure how else we would’ve gotten that much paint. I’m sure the guy at the paint store is to this day cursing me. I wasn’t going away until he added five drops of paint to each bucket and shook them. It took him hours. If you know me, you have been a part of the league any of the years prior to this one or have seen any of our campaigns over the years to raise money for whatever project we were planning next. Then you’ve heard this story. Each time we would improve something here or make the place that much better, the unexpected would smack us full force in the face. We painted the walls, finished the mural, built bleachers, got us a fancy display case, and reorganized to look legit. Then the roof literally, in the actual real meaning of the word, began to cave in. When I see pictures of a random night of the week, 40-50 people were at practice. I remember the floods, the mopping, and the “milking”. So many tarps. Also, I remember not being able to sleep because somehow, someway, the league needed to stay alive. The exact number eludes me, but at one point active dues paying members was down to between 20-25 - barely half the rent. It might have realistically been in the teens. A surplus that I had once taken over in the bank account had evaporated overnight. The roof was always one more month away from being repaired. That’s what I was being told and that was all I could relay. The diminished bank account and almost no resources left us with one option. Hunker down and wait out the storm and the next storm. It’s hard to imagine I’ll forget the worst winter in the history of Philadelphia. Not hyperbole but a fact. The roof was eventually fixed. However, a line item in our lease that was missed by a previous accountant was caught by a new accountant. I was told we would need to start paying for heat, which previously had been missed somehow. New roof, next challenge. Luckily the next winter was one of the coldest in recent memory. The decision to keep the heat off I can’t tell you how difficult that was but we were barely breaking even. We couldn’t afford it. All I wanted to do was turn the heat on. We were finally getting some footing back and membership back up and the warehouse was an icebox. That heat issue wasn’t ever really resolved. We all just learned to deal with it. Two things happened concurrently during these two disaster events: one I helped drive and the other I stood away from as Ratchet drove it. We took steps towards RDCL and MRDA membership. This is what saved the league. The vote to effectively cut ourselves off from MADE was contentious and was another factor in losing membership. However, it is one of the primary reasons the storms didn’t completely decimate the league into absolute collapse. To anyone who was around for the green/yellow walls and people who’ve been around longer than I was around. To the people who helped Lucky, PJRD’s first President, get the warehouse appreciate the ups and downs the league has been through. I know the struggle of getting the warehouse itself. I am forever grateful it was there when I showed up. Even with the impending doom and disaster there have been so many incredible moments. The environment that we have always tried to foster was that of enjoyment. All are welcome. Leave your douche canoes at the door. Those are not welcome. Almost every generation of great skaters has walked in the doors. We held old school events with heroes of the past. Judy, Skip, and Richard shared story after story with us and taught us how to five stride and fall on our butts. We’ve had members of Team USA skate on our track at midnight scrimmages thrown together at the last minute. Some of the best of MRDA, WFTDA, ODSA, MADE, and RDCL have skated in that building. The autograph wall is filled with skaters from every single ruleset and style of derby across all skill levels. The very first Battle on the Bank on the east coast was held in that building. 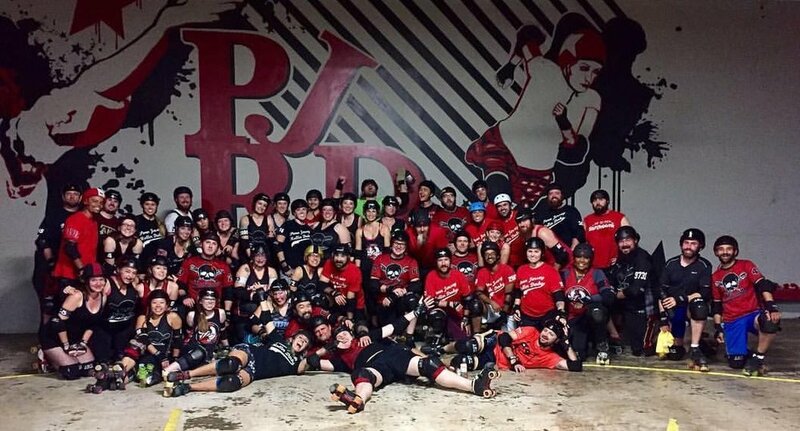 If you only knew how Derby Q started and how it has morphed into one of our biggest events completely by accident. 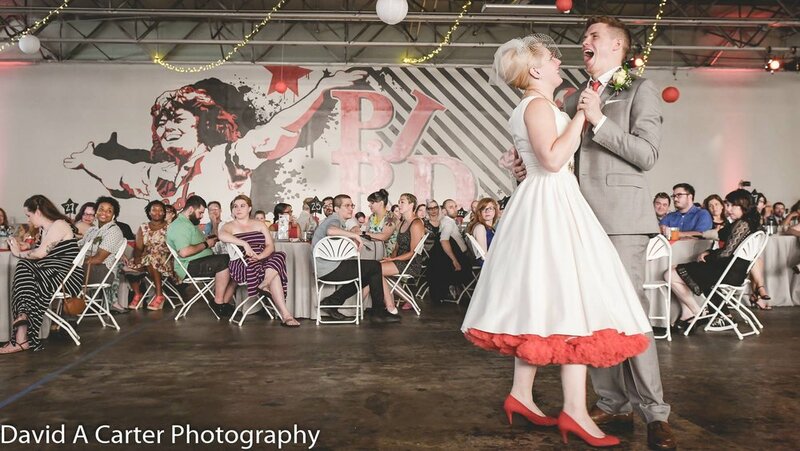 There was a wedding in that warehouse, and so many of us met our significant others there - myself included. Rosie, the absolute love of my life and the person I will spend the rest of my life with, and I met during rookies. Two years later, when I was battling my demons in one of the most depressed periods of my life, she showed up on Day 2 of the great paint project. While I was zipping around the warehouse on office chair with wheels doing my best hummingbird impression, I was losing my mind while painting by myself. Everyone else was partying up a storm at Wildwood. But still the best day ever. This isn’t public knowledge, and I couldn’t tell you how many people know this, but two years ago right around this time yet again I was lobbying for Battle to come to Philly. We were effectively hit with an eviction notice. I was in the process of putting together a pitch to renew our lease. I was told we had about 6 months to find a new place, or we would be forced to leave. It sounds harsher reading that sentence than the actual conversation went. For the next month or two I spent every other day negotiating with the landlord to allow us to stay. We needed more time, and this was a complete surprise. We had finally gotten comfortable there. Before that bombshell, we were organizing a package to expand our space as we shared the back. So, we put up a wall and knocked one down. Then after I left, Stella convinced him to stay one more year. I’m sure Ratchet remembers this conversation I had with him years ago - about not being ready to move because we hadn’t filled out our current shell. The league must be ready for a new shell by now. There’s little doubt in my mind, even though my knowledge of the dynamics and details of the league is not much more than creeping on Facebook, that the league is not only ready for this move but it is also exactly what it needs right now. Kudos and congratulations to Tree and Karen (I don’t know what your derby name is anymore because let’s be real it’s changed more times than Diddy) for not only keeping the league going but also growing. The new space looks like a new exciting mountain to climb. It is for sure sad to see the old place go, and there are so many who share not only tough memories but also many awesome ones. I meant to write a thank you note after Battle. It wasn’t from lack of trying. It kept evolving into a book that I can’t quite finish. From the bottom of my heart I want to thank every single person who walked through the doors and made that place what it was. For the things we accomplished in there, and the obstacles we had to overcome together. It will forever hold a special place for me and I imagine for so many of you as well. Stumbling in there and then eventually meeting my future wife was one of the best moments of my life. Rosie, you are the number one moment but you know there are other awesome moments that are close. I hope for the rest of you it had at least a little bit of impact. Even if it was as small as a good day. PJRD keep on killing it, and the best of luck with the new building. The future is a Timbuk 3 song. Good bye 18th and Indiana, thank you.